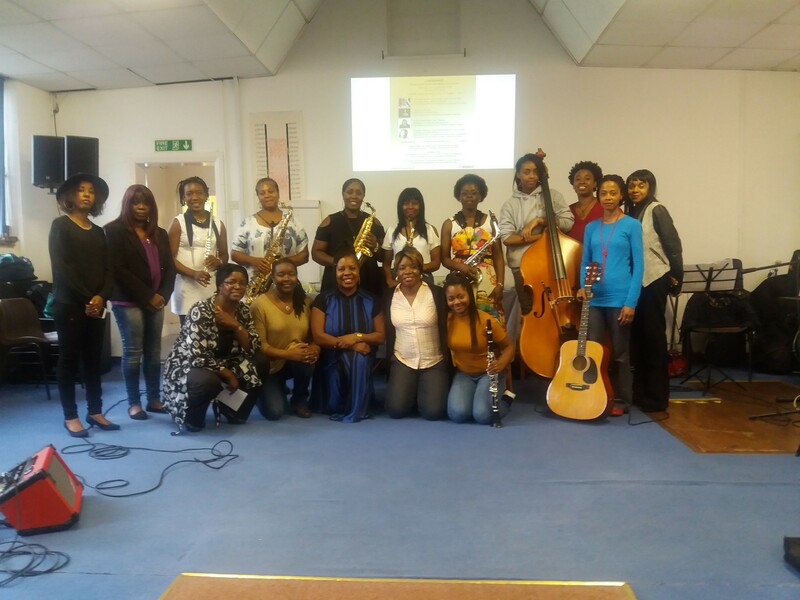 Cafemnee returns on Saturday 17th September 2016 for female Singers and Instrumentalists. So whether your music is a hobby, part time, full time or you are thinking of dusting off your skills, Cafemnee is a space for you to meet other female musicians and be empowered for your musical journey. This year Caf emnee has truly come of age! We have a longer days program as the feedback from previous events have said the session is too short! We also have a Facebook page: https://www.facebook.com/Cafemnee-1348198728541991/ so Like It, Share It! Thanks. Who’s who and what’s what on 17th Sept? We have a truly international roster of guests: Abigail Kelly British born professional operatic Soprano star whose career has taken her to places as diverse as Johannesburg, Jamaica and Poland. Performing in roles such as ‘First Lady’ in Mozart’s ‘Magic Flute’ and ‘Queen Nanny of the Maroons’ in ‘Sacred Mountain’ by Shirley Thompson, Abigail will take us through her journey in Opera. By contrast, Eleth Roberts has been backing singer to A-Listers such as Celine Dion, Elton John, Boney M, West Life to name just a few. 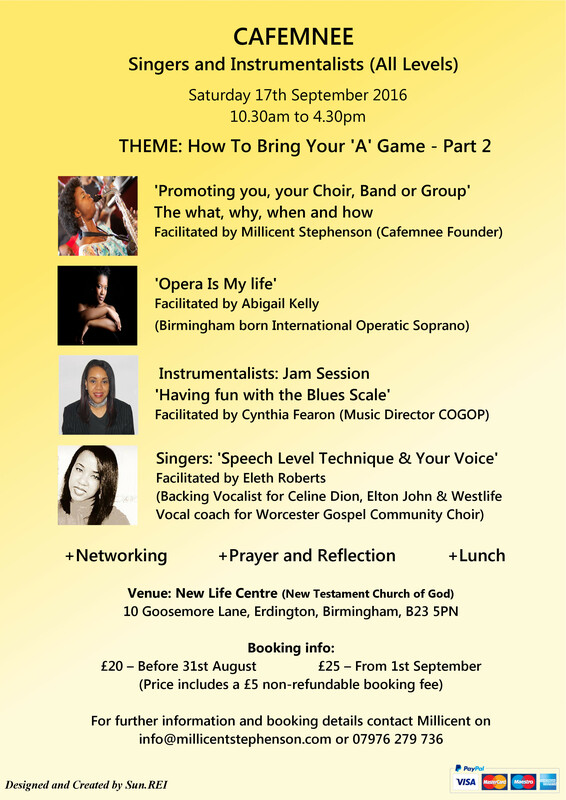 Contemporary, Gospel and Classical vocal coaching are her strengths and she is presently coaching the Worcester Gospel Community Choir. She will help singers at Cafemnee to improve their vocals using the Speech Level Technique. While the singers are with Eleth, our resident maestro Cynthia Fearon, Music Director from the Jubilee Christian Centre will be guiding the instrumentalist in a lively jam session of having fun with the Blues scale. Not forgetting Sheryl Richards who overseeing the sax section. Don’t forget to bring your instruments. These exciting female musicians including yours truly who will be sign posting those ‘A’ game things you need to do to promote your music as a soloist, group, band or choir will be at Cafemnee on 17th September 2016. This will be held at the New Life Centre, Goosemoor Lane, Erdington, Birmingham B23 5PN. This September’s Cafemnee session is definitely one not to be missed. Book your place today! 10:45am Session 1: How To Promote You, Your Choir, Band or Group.- Millicent Stephenson. 3.30pm: Session 4 ‘Coda’ – Instrumentalist and Singers jam together!! Debit/Credit card: Please call me to arrange payment. Additional fee of 50p is will be added to the price to contribute to transaction costs.